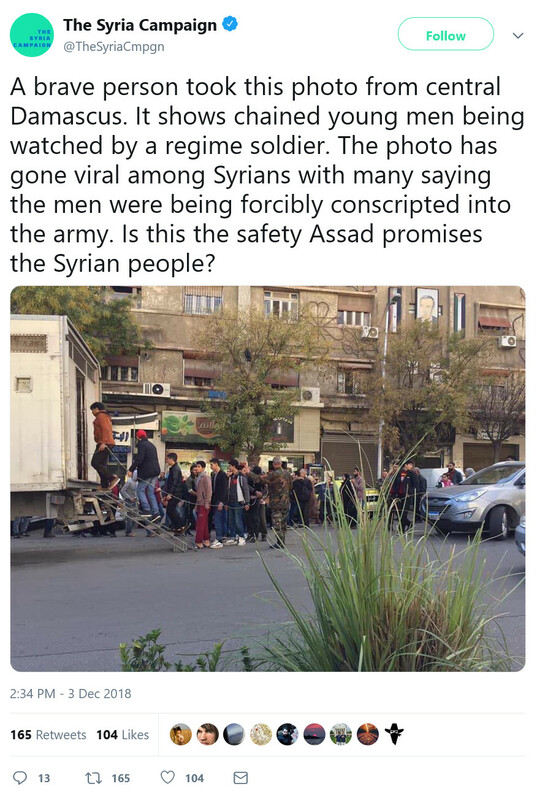 Heartening to see that most of the responses to Asaad Hannaa's tweet and the Photoshopped picture of the men signing up to join the SAA jeered at the pathetic and poorly done attempt to push the fake news of the men being press-ganged into the army within a few hours of the tweet being made. Things must have come to a head when the propagandists don't even make any effort to ensure their Photoshopping efforts look at least faintly plausible. Netanyahu definitely has a fixation with eliminating both Iran and Bashar al-Assad. 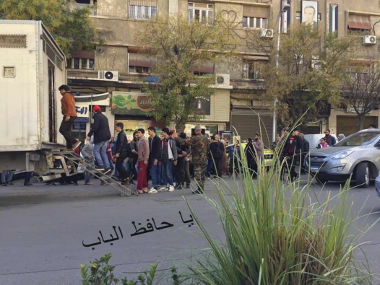 Meanwhile in the real world, Assad has just issued a state pardon for those who didn't join the armed forces, and for opposition fighters who renounced violence. A total of 14,522 have been pardoned. Looking carefully at both images from the twitter source i think that the chained version may be the original and the non-chained seems photoshopped. I am not an expert on this matter so I am not sure. - The distance between the hands on the chain does make sense if a single long chain is fed through the handcuff bracelets so the people can freely slide along the chain. It would be more practical as only the first and last person needs to be locked at the ends. - The last person in line looks like being shackled by someone. - The image with chain has a wider field of view. The image without chain has a few pixels cropped off from all edges. The cropped pixels may still be there though, hidden inside the jpeg block padding data, but the reverse proces of making hidden padding data visibe during processing (when adding the chain) is highly unusual. - But best proof is perhaps this tweet. But chain or no chain, it does not really matter. Just an image does not prove a storyline. i breathlessly await luke harding's take on this in the guardian. i don't see how the tweet provides proof at all. When I click on " a donation" the message "This www.moonofalabama.org page can’t be found" appears. For "prisoners", the young men are quite relaxed, and so is the "guard" who points his finger and does not grasp any weapon. Moreover, there is a young man in black jacket and red-white sweater ambling to join the queue. The "shackling" looks perfectly voluntary, if not photoshopped, the end of the rope is handed in. 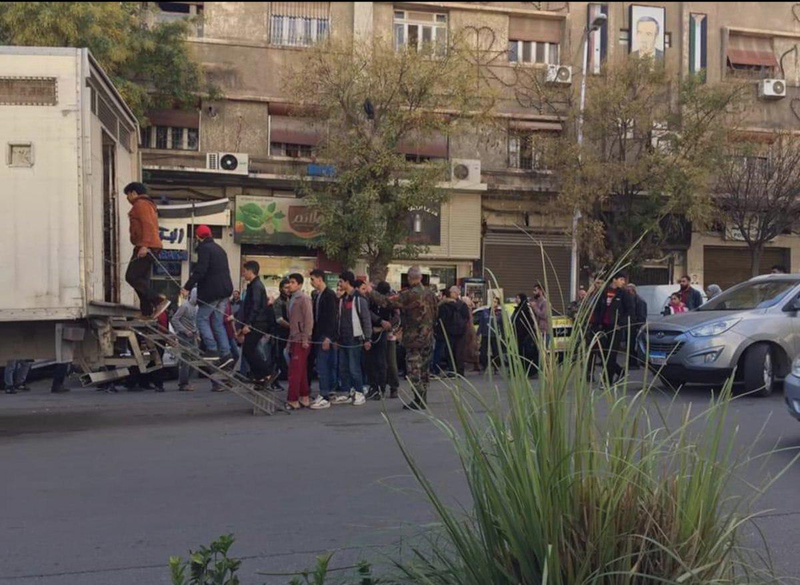 My conclusion is that if the picture is "legit", then the rope is simply voluntarily in the hands of the men in the queue , and the leisurely "shackling" plus a black jacket man who approaches the line show that men are joining the queue without any overt threats. 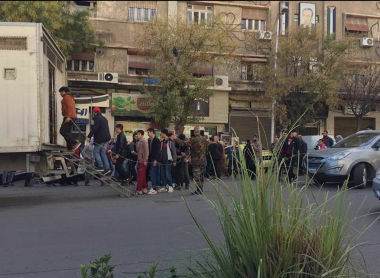 Seeing unruly queues in southern Italy, I would guess that organizing lines may be a problem in Syria. Well, one can see ropes along the queues at our airports. 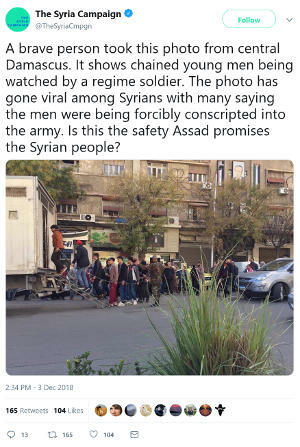 BTW, "forcing to join the army" means "compulsory military service" which was the norm in Western countries a generation ago, and it is still present in "allied countries" like Israel, Turkey, Greece, Korea, Georgia, Ukraine etc. Evading the compulsory military service always carries a penalty. Did Hanna deactivate his Twitter? Cannot find original tweet. You omitted the Outlaw US Empire where one must register for selective service despite it's not having been in force for decades. Not doing so can create lots of problems, including arrest. The recent Zionistan attack on Syria turned out to be an excellent readiness exercise for the newly integrated air defense radar system that chose Pantsirs as the best defensive weapon, downing all missiles and one drone--no S-300 was employed. In perhaps one of life's bigger ironies, Zionistan's being brought to a standstill thanks to a massive Domestic Violence-based protest, but omits mention of the Palestinian Genocide. The treatment meted out between the two groups is stark to say the least. Where're the IDF snipers killing off these violent Jewish women bent on disrupting Israeli society as they do to Palestinians!! as one of the debunkers noted: there is no slack to the chain meaning the initial "shackling" would have required the men to basically sit on each other's laps. 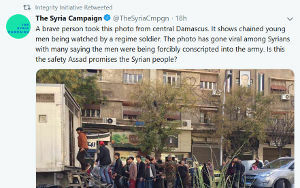 my fave response from the usual twitter propagandtards: "typical regime tactic - photoshop a picture so we'll post it and look dumb!" 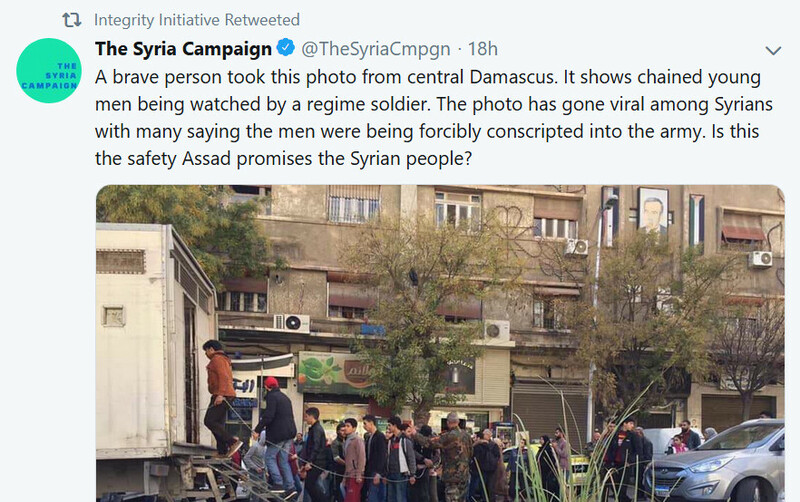 so we can now add "we're idiots" and bad photoshopping to the list of things these people blame on assad. as opposed to their idiot parents and their failing educational systems. 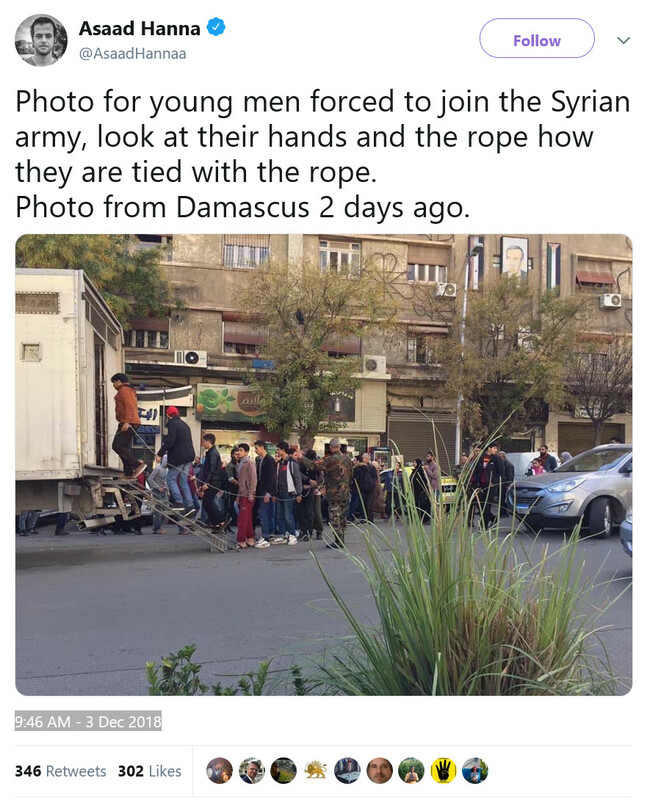 A small question: I am not an expert on telling photoshopped pictures from the original ones, but the longest freely hanging segment of the rope seems suspicious, namely, it has extensive nearly straight portions. Can one show that this is not consistent with the principles of mechanics, or conversely, that it is? The curvature should be described by the equation of the catenary curve? My own course on that happened long time ago but I will try to plot the equation for the amusements and edification of the sophisticated readers of MoonOfAlabama. Perhaps the longest section is under tension. OTOH, assuming equal lengths, the chain between those closest to each other should hang, but do not and appear to be straight. So perhaps the chains length between the men are unequal and all under tension. Seems unlikely to me. 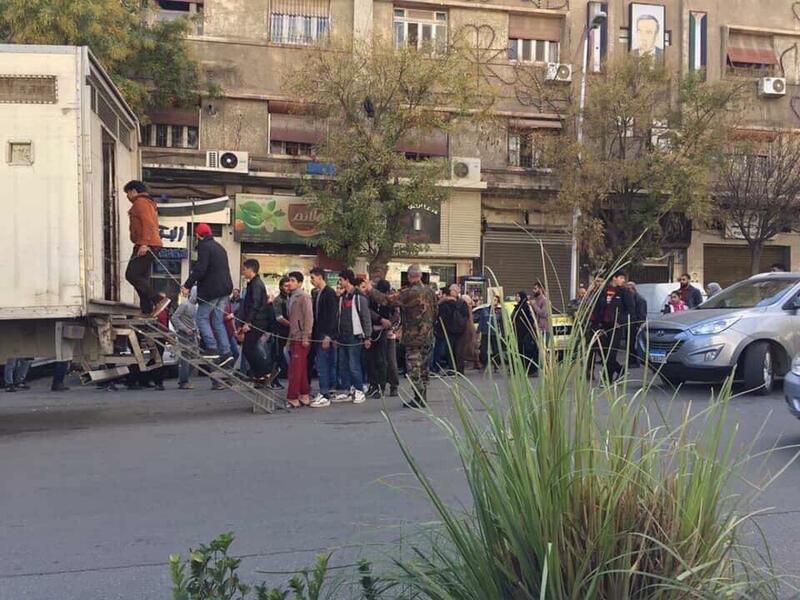 re jen 1, The is cumpulsory military service in Syria, i.e. conscription for the war. The soldiers aren't free volunteers. But those who didn't want to fight deserted. I know a number of Syrians who did that. Before the war, the army was enormous, and little motivated to fight. Now it is small and reduced to the bone, but now they are experienced and ready to fight. not the first time they have used lies from this convicted slanderer villavicencio. i'll try to post a link to this at the guardian itself, but they mod a lot of my comments these day (shocking, i know). "Press-ganging" as I called it @ 1 or impressment and compulsory military service are two rather different practices. Impressment includes the random seizure of people as military recruits at short notice or no notice at all. Impressment by the British navy of US citizens working on US merchant ships in the early years of the 19th century was one of the causes of the War of 1812: the US had had enough of British seizure of its own citizens to the extent that US maritime trade with other countries was being damaged (perhaps deliberately so by the British). 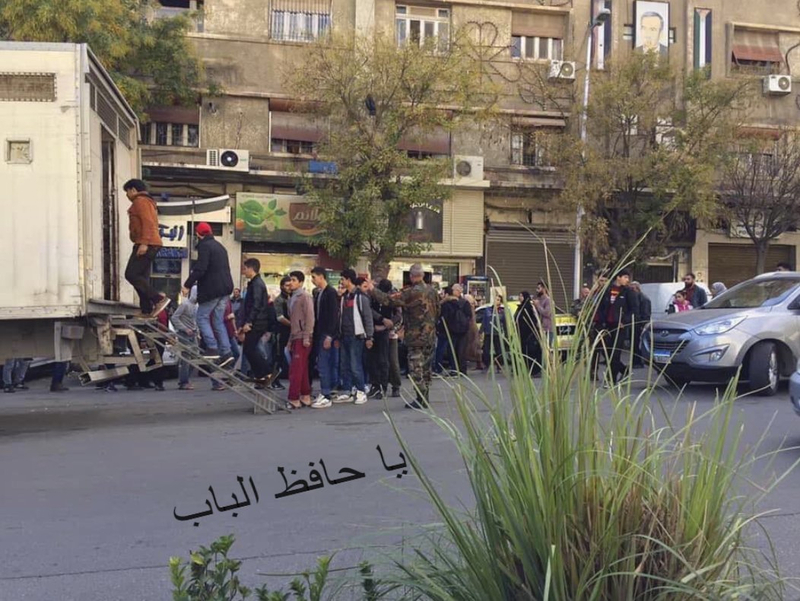 In Syria, men are conscripted into the army at the age of 18 years but men can apply for exemptions if they can demonstrate that they have no older brothers who can care for their parents while they are away. "Tension" can make a rope segment more straight, with smaller tension, more slack, but if the static model is applicable, then the shape should be similar to a part of the plot of 2 cosh(x) = exp(x)+exp(-x), and it does not seem to be the case. OTOH, static model perhaps does not apply because the suspicious segment is between a man who walks up and a man who stands behind him. But pulling a rope creates a wave, so I think that the shape we see there does not correspond to the laws of physics but to difficulties of drawing it without a proper French curve and a background in physics. Excellent work. This is the best way to expose lying propaganda. I also noticed that the banners in the top right hand corner did not show Assad or the Syrian flag. I suspect they might be old banners of the King of Jordan when he had a beard, the bottom half of which has been fudged over but they didn't bother trying for a mouth. The flag on the right could be the Jordanian flag with the red triangle washed out with age. Then there are the shop signs, some of which are not in Arabic. I'd be interested to know what was going on in the van. It reminds me of the old Xray vans which once toured our Australian suburbs and schools taking free Xrays to identify those with tuberculosis. Fitzhenrymac @ 20: That poster in the top right-hand corner looks a bit like a portrait of Hafez al Assad who was President of Syria from 1971 to 2000. How come NATO wasn't asked to bomb the UAE?? good blog. tanks for share. 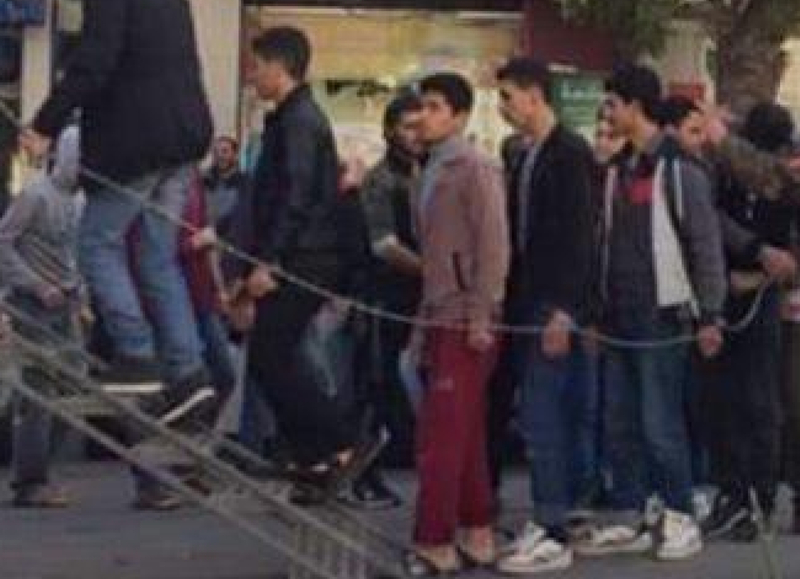 Just what is that rope or chain attached to on the men? Maybe crazy-glued to the wrist? If one is shackled or handcuffed one does not walk with one's arms at one's sides. This one's easy enough to clearly decode as a fake, without any fancy calculations or digital pixel enlargement equipment, if your practical or have ever worked in construction. Firstly, an open staircase such as the one in this picture would more likely than not have had a potable safety hand rail attachable to it. That this one clearly did with a chain stretched between a vertical post in line with the first step and one at the beginning edge of top landing platform (both marginally digitally airbrushed out)is evident by the stress on the chainlink rail. Notice that just behind the wrist of the guy dressed in orange standing on top of the platform the chain link railing slants down in a straight line to guy on the stairs just behind him in the black coat. Notice his hand is cupped as his's holding onto it and putting pressure on it (while the guy behind him is not holding on to it). after which the chain goes in a straight line again to a vertical point straight up from the first step, at which point the second vertical post has also been digitally removed. After that you can see that the chain is poorly drawn onto the next guys wrist in red pants and after that just as poorly to the others lining up. You can also still see faint traces of the top vertical post left in a thin green line on the guys pant leg. Just take a ruler or straight edge to all the points I just mentioned and you can see clearly it's consistent with a chain hand rail made taught by the pressure the guy in the black coat is putting on it. Any amateur digital photo shopper would have figured out exactly how and why this photo is an obvious hoax in under a minute. The fact that it fools anyone is a testament to how many people allow themselves to be told what to see, just like when the towers on 911 disappeared into dust clouds drifting up into the atmosphere leaving next to nothing left falling back onto the ground.